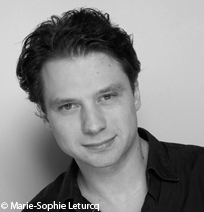 A Swiss composer born September 9, 1968 in Lausanne. With First Prizes for the double bass and for counterpoint from the Paris Conservatory, a diploma in composition from the Royal Academy of Music in London, Richard Dubugnon is a classical bass player, an improviser and a composer. His passion for history (sated by studies in this discipline) but also his attraction to painting, the cinema and literature, finds echoes in his works. Richard Dubugnon champions a visual, dramatic, contrasting, pictorial style and particularly loves the voice and the stage. He acknowledges multiple influences, from Johann Sebastian Bach to Arthur Honegger, but also funk music, hip-hop and the Bee Gees. In point of harmony, his compositions, colourful and subtle, resemble post-Debussy French music, while incorporating the modal complexity of a Bartók and the idioms of modern jazz. Their structure and rhythmic force are more influenced by Germanic music. His works include Mikroncerto I (2000), Ellébores (2002), Sonata phonomorphique no 1 (2004), Le songe de Salinas (2004), Arcanes symphoniques (2007), Concerto for violin (2008), Pentalog (2010). Les partitions éditées de Richard Dubugnon sont publiées par Alphonse Leduc.